Yoga isn’t just for moms and dads! The practice of yoga can help center your child, leading them to maintain healthy bodies, improve their school life and help with speech development. Best of all, yoga provides the perfect opportunity to bond emotionally and spiritually with your child. 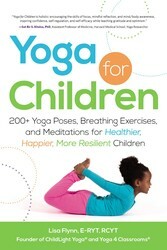 Lisa Flynn, author of YOGA FOR CHILDREN, shares poses that are perfect for you and your child. Your child might feel overwhelmed on a daily basis. Many children today are suffering from a lack of connection to their bodies, to their environment, and to themselves. Our information-saturated, hectic, and stimulus-rich culture pulls kids in many directions, splitting their attention. For many children, it has become too much for their young, developing minds to absorb and process. More and more American children from all walks of life are overweight, have stress and anger issues, and have attention and learning problems. There is a real separation of mind and body—your child’s attention might be pulled outward toward the ever-increasing distractions of the external world. Overworked parents and overscheduled children often face isolation from their families and their communities. Rather than sitting down to dinner together, it is now quite common for children and parents to communicate mainly via text messaging and e-mail. Does any of this sound familiar? As mindful parents and adults, we must give our children every tool possible to assist them in counteracting a culture and environment that is potentially hazardous to their health and well-being. Through the use of yoga tools, stories, and play, we can provide children with opportunities to grow physically, mentally, emotionally, and spiritually, helping them connect with themselves and others with compassion, understanding, and clarity. In 2012, the CDC reported that childhood obesity had more than tripled in the past thirty years. 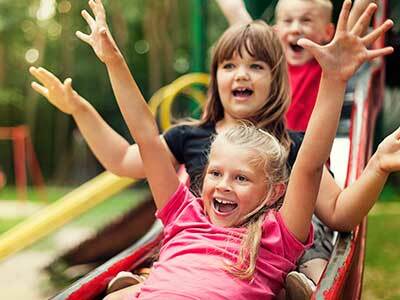 Children are simply spending more time indoors and less time moving. Even if your child is active, she can still benefit from yoga-based movement. With regular practice, her muscles, bones, and joints will lengthen and strengthen as her overall flexibility is improved. In addition, all of your child’s major bodily systems are supported by movement and improved circulation, including the digestive, endocrine, immune, and respiratory systems. Yoga strengthens your child’s entire body! Anti-bullying, health and wellness, and character education are all popular topics in American education today. As standardized testing has become more common, so has performance anxiety and stress in students (and teachers). It is not surprising to note that across the world, yoga and mindfulness education are increasingly being incorporated into the classroom day to help address these concerns, and with great results. Yoga, by nature, supports and maximizes the learning process. Students experience improved concentration and creative thinking, and due to improvement in executive functions, they are better able to prioritize and organize. By doing yoga with your child, you will help him build better relationships with other students by promoting a sense of connectedness. If your child is athletic, a yoga lifestyle will help him maximize his performance by improving his focus, strengthening his muscles, improving his flexibility, and fostering team cooperation. If your child experiences social anxiety, yoga can help instill a greater sense of self-knowing, self-worth, and confidence. While yoga is becoming wildly popular with kids everywhere, one significant benefit often overlooked by parents and educators is the aspect of speech development. “Yoga,” “yogurt,” or “woga” classes can help advance a young child’s speech development through slow, repetitive verbal instructions, songs, and the imitation of simple sounds found in nature. Children with speech delays are often more physical in nature, especially boys. A movement class like yoga can pair physical motion with repetitive sounds, which will likely catch their attention more so than a simple, quiet conversation. For example, a preschooler who has not yet mastered sounding out letters like S and Z might enjoy slithering like a snake, not only attempting to “hiss” but also watching your mouth as you hiss and lower yourself to the ground in Cobra Pose. After repeating this pose in subsequent sessions, he will immediately recognize the word and sound that go along with the pose, and hopefully gain the confidence to try to say it himself. Need more ideas for family bonding time? See our 7 ideas. Help your kids de-stress and get healthy!Yoga for Children will encourage your child to learn about yoga with an attentive, at-home instructor--you! Even if you are new to the practice, author, mom, and children's yoga expert Lisa Flynn will guide you and your child through more than 200 yoga poses, meditations, and activities that are suitable for children between the ages of two and twelve. Complete with full-color photographs, instructional scripts, and pose modifications, Yoga for Children will help build your child's confidence, self-awareness, and focus while strengthening your connection--one yoga session at a time.